← Mid-Season Codling Moth and Obliquebanded leafroller Mgt. July 5th. Spotted Wing Drosophila, Drosophila suzukii (SWD) is a vinegar fly native to East Asia. 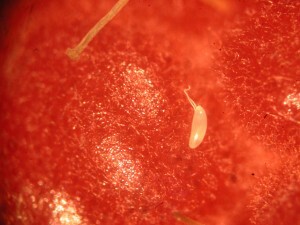 The insect established in the Eastern US in 2012, and has become an invasive insect pest of small fruit and grape. In years of early emergence, it can have significant impact on the NYS cherry industry. 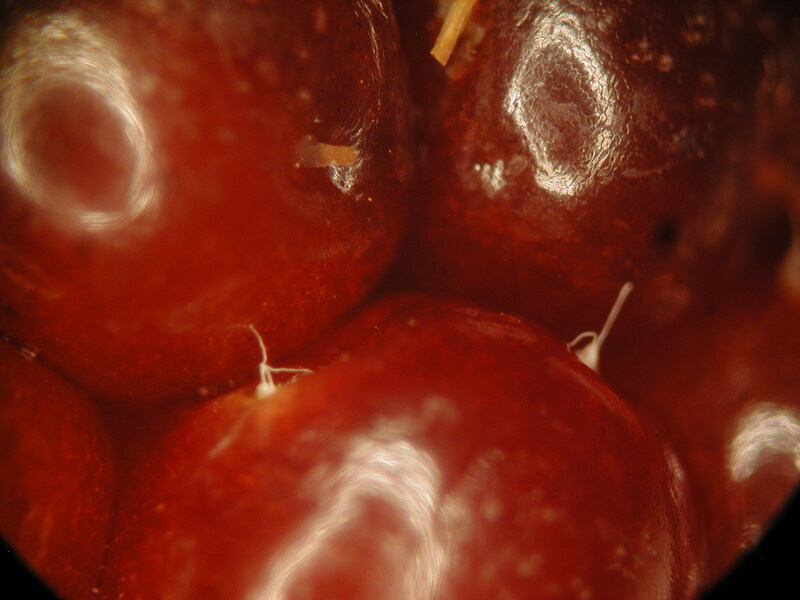 Synopsis: In Orange, Dutchess and Columbia Counties growers are finding ovipositional injury (punctures and eggs) with larva present in managed mid-season cherry fruit. 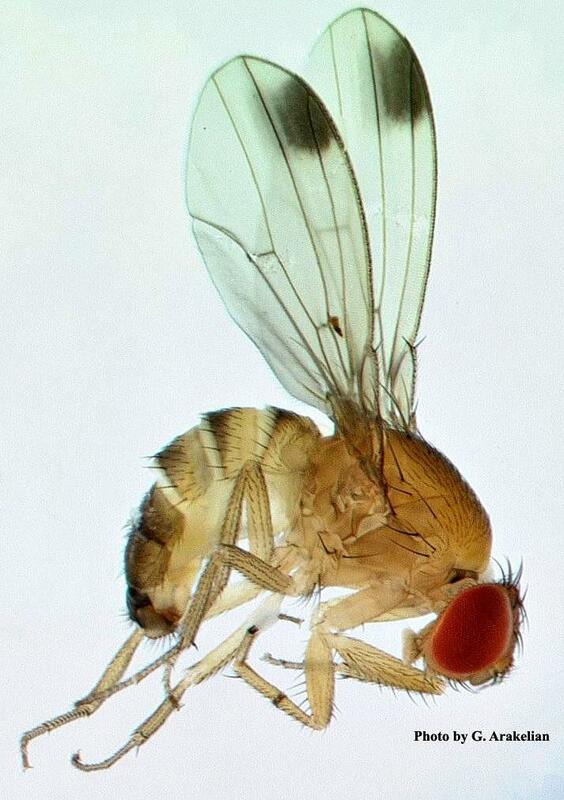 In our SWD traps at the HVRL, placed in early June, we had our first observation of adult spotted wing Drosophila (SWD) Drosophila suzukii, on the 27th of June. In Western NY, the first SWD adult capture was sited on May 31st followed by Suffolk trap captures finding SWD on June 1st. Needless to say, this is the earliest emergence of SWD in the state with economic loss from the pest in early season sweet cherry. Late cherry varieties such as Regina, Sweetheart and Hudson should be protected on a tight program (3-7d) to reduce infestation from SWD as harvest continues. Pick your own blocks should, by design, be managed to alternate picking based on Pre-Harvest Intervals (PHI). 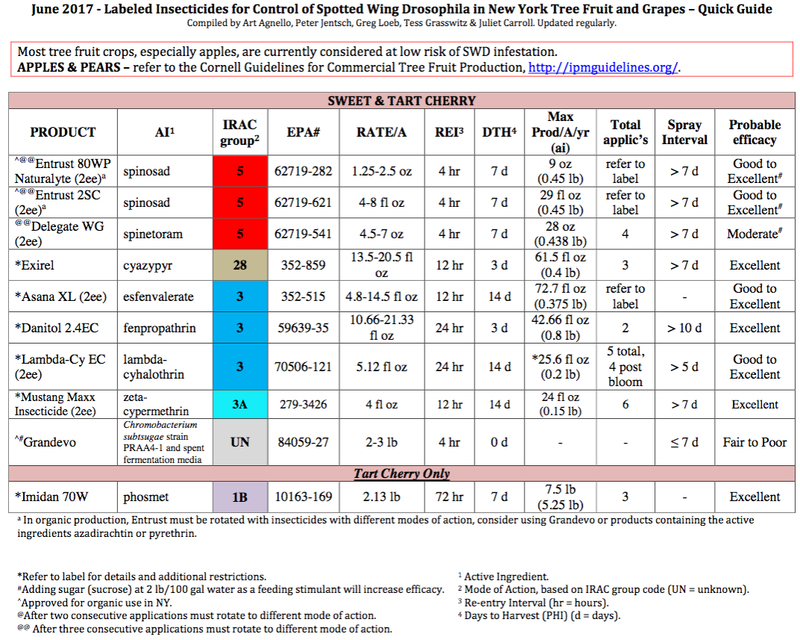 Management options for sweet and tart cherry are available on the tree fruit and grape guidelines for insecticide use, and should be used for treatment option decision making for this season as label changes and new materials have been added to the list. Raspberry and blackberry should be on a 3-4 day program and blueberry on a 7-day program. PDF files for Small fruit management guidelines for insecticide use can also be found using this link. 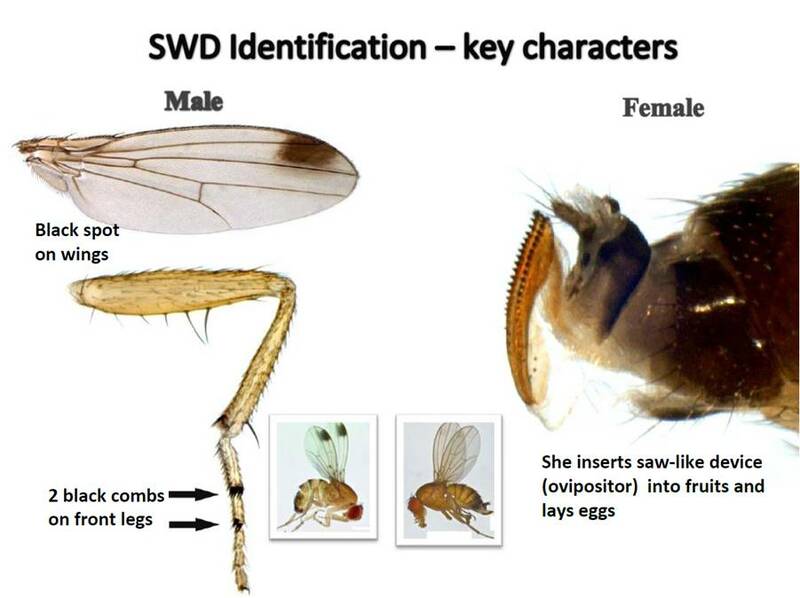 Overview: There are only three effective classes of insecticides labeled for use to manage spotted wing drosophila on sweet cherry. They include the pyrethroids (IRAC Class 3): Asana XL 0.66EC (esfenvalarate) and Lambda-Cy 1EC (lambda-cyhalothrin); and the Spinosad class: Delegate 25WG (spinetoram) and Entrust 2SC and 80WP (spinosad); and the Diamide (IRAC 28) Exirel. The organophosphate (IRAC Class 1): Imidan 70W (Phosmet) can only be used on tart cherry. To date, SWD adults have been captured across NYS in all Hudson Valley counties including Suffolk, Orange, Dutchess, Columbia and Ulster in cherry, raspberry, blueberry and blackberry plantings as well as much of the fruit growing regions along Lake Ontario.